The Cavaliers secured back-to-back victories this weekend with their win Saturday night over the Cadets during the DCI Madison presented by Drums on Parade event. The Cavaliers (79.500), who took home the last gold medal to be awarded at Camp Randall Stadium during the 2006 DCI World Championships, did it again by sweeping all captions and reamaining undefeated as the corps' "Samurai" program carved its way to another first place finish. The Cadets (2nd, 77.200) were strong across the board; only in the percussion caption were they passed by the bronze medalist Bluecoats (3rd, 75.000). The Bluecoats knocked away a medalist position from Carolina Crown (4th, 74.600), a switch of the previous night's results in Normal, Ill. The Boston Crusaders (5th, 71.100) led the Blue Stars and Glassmen (both 6th, 69.700). The Blue Knights (8th, 68.400) moved into position ahead of Spirit (9th, 67.900) and the Crossmen (10th, 66.800). The Troopers (11th, 65.700) edged out hometown favorites the Madison Scouts (12th, 65.400), and cross-state competitor Pioneer (13th, 58.700). In the Open Class, Revolution of San Antonio, Texas (1st, 69.300) outscored the Colt Cadets (54.800). Another Wisconsin corps, the Racine Scouts (3rd, 49.400), found strong audience support for its Frank Sinatra repertoire. Three all-age corps opened the evening's competition with the Minnesota Brass, Inc. (76.000) taking the gold medal back to Saint Paul. The Kilties (67.125) finished in second ahead of the other Minnesota all-agers, Chops, Inc. (3rd, 63.750). The Bluecoats found themselves behind Carolina Crown Friday at the DCI Central Illinois contest by a point, but tonight produced a four-tenths lead with their boxing themed program, "The Knockout." 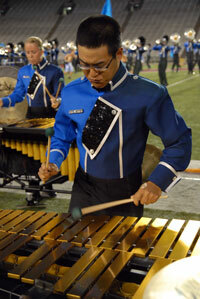 "We're very excited about our result today," said Bluecoats drum major Joe Falcon. "Each day we're adding to and changing parts of the show, so we're really happy to be making progress." Mike Huebner, also a drum major for the Bluecoats, agreed. He said, "We've been working hard, and that's what we're going to continue to do all summer." The Cavaliers, in first with a 2.3 point lead, had to battle some of the inclement weather passing through Madison earlier this afternoon. Drum major Alex Harmon said, "The guys were definitely very energized tonight for this show. We had an interrupted day with these rain storms. We rehearsed this morning before lunch. We got outside and were getting ready to rehearse the full ensemble when the skies opened up, and we all ran back inside for cover. 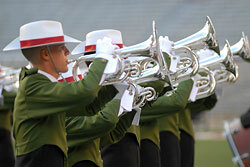 We got about an hour of ensemble time with a run-through at the end." Still, said Harmon, "The guys did a really great job tonight pulling the energy out of somewhere and making the most of the show." The Madison Scouts closed the evening with a special encore performance for their hometown crowd, including a standstill concert of their 2008 show "La Noche de la Iguana" and "Through the Eyes of Love" from the film "Ice Castles." They finished by singing the corps' traditional song, "You'll Never Walk Alone." Three Drum Corps International Premier Events await fans next week for the Fourth of July weekend, with corps taking the field in Pasadena and Stanford, Calif., as well as Kalamazoo, Mich. Find an upcoming DCI Summer Tour event near you.